Take this supplement! Go on this diet! Do that workout program! Buy this exercise equipment! Whether you are watching TV, reading a magazine, browsing the internet or walking down the street you are constantly bombarded with advice about how to lose weight. The problem is most of the “advice” you see and hear is really advertising that is trying to make a profit from your excess body fat. Even if you ask people that obviously know how to stay in shape whether they are working out in your gym or members of your family their advice shares the same pitfall as reading a “4 page ad report” out of your latest copy of “Muscle & Fiction” magazine. The primary reason why following poor advice is one of the top reasons people are fat and getting fatter is because the advice is so generic. The advice could apply to 99% of the population but if you fall in the 1% which it doesn’t apply to, you will waste your time, money and patience and of course, get fat. 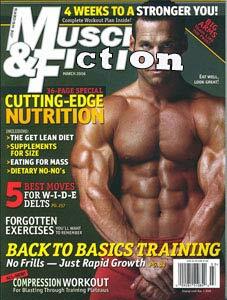 Educate yourself about physical fitness and weight loss from trusted sources. Whether you check out a textbook from the library, use online medical journals or take a fitness class, learning all the scientific information you need will take far less time than constantly falling short of achieving your goals due to following poor advice. Everyone is familiar with this scene. Woman breaks up with her boyfriend and all hell breaks loose in the kitchen. Before you know it, there is an empty pint of Ben & Jerry’s ice cream, a devoured cake and a box of chocolate bonbons. Each case of emotional eating may not be as extreme as the prior example but they often add up. Eating out of sheer boredom is another form of emotional eating. Eating a whole bag of chips while watching the football game is another form of emotional eating. For whatever reason people are getting fat and fat people are getting obese by eating because of psychological cravings rather than physiological hunger. 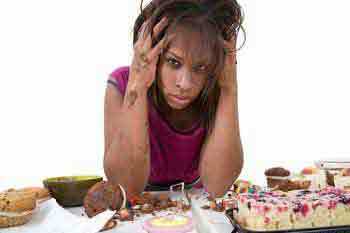 Emotional eating is one of the most difficult things to avoid. Aside from the obvious & expensive possible solutions of regular visits to a psychotherapist and/or prescriptions it is best to try to deal with your emotional eating the natural way. Getting your life organized with a regular exercise program, sleeping patterns and healthy balanced diet will go a long way to curb your emotional eating. Having a clear understanding of how your diet and mentality affect your weight can have a huge influence in your life. Skipping breakfast not only robs you of your morning & afternoon energy it causes you to eat more throughout the day. Those that skip breakfast are far more likely to binge for dinner or reach in the fridge for that midnight snack. In addition to skipping breakfast because “they don’t have time”, people often follow poor advice and skip breakfast purposely to exercise on an empty stomach first thing in the morning. It may be breaking news to you but skipping breakfast before exercise in the morning will have the same effect as skipping breakfast just because “you don’t have enough time” which is overeating later in the day and getting fat or fatter. Consuming calories from liquids causes people to get fat simply because it is so easy to consume calories via liquids. Excessive calories are increased even further when people consume high calorie beverages along with food. While you may already know that sweetened coffees and teas are going to get you fat, even “healthy” drinks such as juices, fruit smoothies and even milk are likely going to contribute to your unsightly bulges. Drinks are mostly low in fiber which makes them easy to digest therefore not filling. Keep in mind a glass of orange juice has around the same amount of calories as 4 oranges and you can get an idea of the high likelihood of overeating. 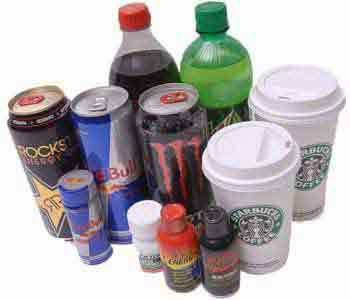 If you don’t want to get fat most nutrition experts recommend to virtually eliminate your liquid calorie consumption. Therefore for those who don’t want to get fat water is always going to be the beverage of choice. Dietary fiber is not only needed for smooth digestion, the indigestible bulk it provides helps you get when eating. People are getting fatter because the increased amount of fiberless processed foods in their diets. When people eat lots of processed carbohydrates such as white rice, white bread, pasta, boxed cereals & sugary beverages they are able to stuff themselves with more calories as opposed to a high fiber meal. Pretty much the complete opposite. Make sure the carbohydrates in your diet consist of whole grain foods such as 100% whole wheat bread, oatmeal, quinoa, brown rice and the list goes on and on. There are several reasons why eating out has gotten people fat and are getting them fatter. The primary reason is because 99% of the restaurants you will be eating out at will be preparing the food with 0 concern for your body weight. The menus at restaurants are not created with caloric content nor your waistline in mind. Combine the fact that the portions are usually large and the food is prepared to taste good with added fat and sugars and you will be consuming astronomical amounts of calories which will get you fat. Controlling your dining out is one of the most difficult things to do. Try to avoid eating out by yourself and prepare your meals in advance. Since most people’s social life revolves around dinner parties, lunch meetings and family meals avoidance is often not the best way to deal with it. Choosing lower calorie foods and drinks, ordering smaller portions and even not finishing all of your meals are ways to help you not get fat from eating out too much. First off alcohol and most alcoholic beverages have zero nutritional value. The alcohol itself has 7 calories per gram as opposed to carbohydrates and proteins which have 4. 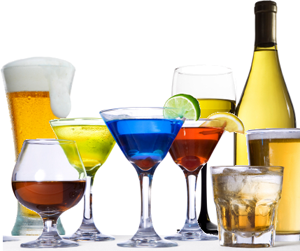 Unlike protein and carbohydrate, alcohol takes very little energy to store as body fat. Often times it is not the alcohol which makes people fat, but the fluid which provides the taste. 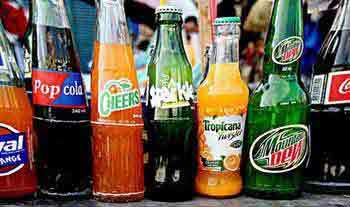 For example mixed drinks are often mixed with high sugar syrups and colas. People are fat and getting fatter because alcohol calories are empty and add up quickly. A weekend barbeque and birthday party can quickly add 2000+ excess calories to your weeks caloric intake. Do this 4 times per month and you would have gained over 2 pounds of fat just from your alcoholic beverage intake alone. Plain and simple; avoid alcohol. If this is not a feasible option keep your alcohol intake in moderation. Try to opt for that healthy single glass of red wine per day rather than a bottle or 2 on the weekends. If you have the big party to go to, try to stick with low calorie drinks such as vodka & soda rather than that sugary cosmopolitan or pint of Guinness. You know the routine. You wake up in the morning and still feel exhausted. You drink your usual couple cups of coffee for some energy to start your day. After lunch later in the day you become fatigued. Again you reach for a can of soda, a Red Bull or another cup of coffee to get you through the rest of the day. You get home from work and are tired again, so you watch TV, eat without exercising all day and go to bed thinking about drinking coffee the next morning. This is the normal routine of countless caffeine addicted people throughout the world and it is why caffeine is a reason people are getting fatter. People who are healthy have little trouble regulating their insulin and blood glucose levels but it is not true for the overweight. Overweight people, especially those with type II diabetes who consume caffeine have increasing problems regulating their insulin and blood glucose levels. This is accompanied by the exess production of stress hormones which may lead to adrenal fatigue and other problems. Further compounding the problem, caffeine is the most popular weight loss drug and the primary ingredient in countless fat burning supplements. This causes people to associate caffeine with weight loss when in fact for most people, it is likely to cause them to get fatter. 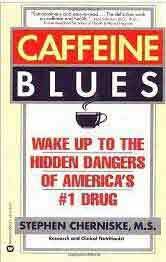 If you’d like to learn more about how caffeine effects the body, check out the caffeine and exercise article. Like many things on this list, moderation is the key. Consuming coffee and other caffeinated beverages in moderation will let you avoid addiction and the pitfalls of excess caffeine consumption. It should go without saying that if you drink coffees and teas, avoid having them with excess calories such as honey, sugar, chocolate, caramel and anything else Starbucks has to offer. It is easy to get fat from consuming fried foods for the simple fact that fat has twice the calories of carbohydrates and proteins. Each gram of fat provides 9 calories of energy and unlike protein and even carbohydrates your body can store dietary fat as body fat with little or no energy. In addition to having more calories on average, fried foods almost always have excess empty calories added by the carbohydrate breading. Fried carbohydrates have almost zero nutritional value as they are devoid of vitamins and minerals. 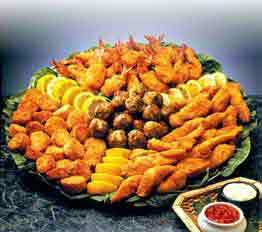 Eating fried foods can be avoided by most of the civilized world. All foods that are commonly fried can be prepared more healthy or eaten raw. 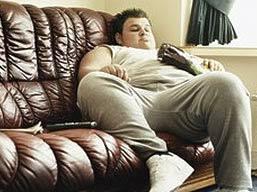 The all-too-common sedentary lifestyle continues to be one primary reasons why people are fat and getting fatter. Of course being physically inactive alone will not cause you to get fat but most fat people consume excess calories in addition to not exercising enough. In addition to burning calories, regular exercises improves the health of almost every body system and and improves bodily function. Even those who think they exercise regularly are still getting fat. This is due to a combination poor nutrition and improperly exercising correctly. 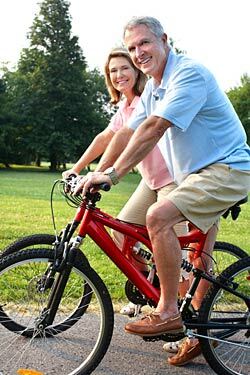 A large percentage people who exercise regularly only participate in a single activity, neglecting other important aspects of physical fitness which will ultimately lead to injury, disinterest and other excuses people use once they get fat. Most people know they are supposed exercise but really don’t know how much. Even a little exercise goes a long way to keeping the pounds off. If you can keep your caloric intake low by NOT doing most of the things on this list exercising for 30-60 minutes 3-4 times per week could be all it takes to maintain your current shape or even lose some fat and tone up. Having a balanced exercise program which includes all 5 components of physical fitness will go a long way to help you lose weight, stay in shape and not get fat. Over the years while portion sizes have gotten larger people have started eating more. What happen first is like asking, “what came first, the chicken or the egg?” but is beside the point. People get fat because they consume excess calories, period but how and why is usually another question. Eating too much can also be due to not eating often enough! There are not many people who get fat from eating too many small meals. 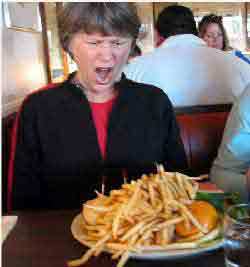 People get fat because they eat large portions which not only contain excess calories but slow down their metabolism. People also get fat because they attempt the 5-6 small meals approach, but lack the self discipline to keep the meals small. Eating more often can backfire if the portion sizes big as the chances of increasing excess calories greatly increases. Last but not least is going into “starvation mode.” This occurs when you starved body slows down its metabolism as a protective mechanism. People often try to lose weight by not eating and in turn slow down their metabolism so consuming even less calories causes them to get even fatter. If consuming large meals and eating too much has been an issue for you the first step is to identify the reason why you are overeating. Are you letting your emotions control your actions? Are the people who surround you a bad influence on you? 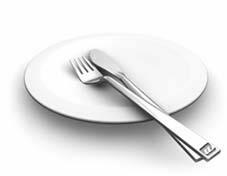 Are you eating at restaurants which serve excessively large portions? Whatever the reason for consuming large meals is, you simply need to exercise portion control. Whether it is by choosing healthier, more satiating foods or simply only eating 1/2 of the high calorie meals, eating less is ultimately going to determine whether you are going to stay in shape, lose weight, get fat or get fatter. Starting your day with a healthy, balanced breakfast and consuming another low calorie, balanced meal every 3-4 hours will help increase your metabolism and help you avoid putting on extra pounds and getting fatter.